Cost to install kitchen cabinets varies from $40 to $110 per cabinet and actual prices will be determined by a number of factors. 1 Prices for kitchen cabinets analyzed based on standard installation of cabinets only, not a kitchen remodeling. Charges for preparation work and moldings installation will be quoted separately. All prices for kitchen cabinets installation in the charts are approximate and exclude any materials expenses. 2 Average labor expenses were calculated accounting installation of kitchen cabinets in the whole kitchen with minimum 14 wall and base cabinets. Smaller projects will be estimated at higher rates per cabinet installed. 3 Difference in cost indicates your savings or how much more you should expect to pay for installation of certain type of kitchen cabinets in comparison with a cost to install semicustom kitchen cabinets. There are different ways a carpenter might price the labor expenses to install kitchen cabinets. Total price can be calculated based on time spent to complete the project and hourly rate of an installer, charge per linear foot of a kitchen or cost per each cabinet installed. Because variety of types and sizes of kitchen cabinets available on the market the most effective way for homeowners to understand how much they should expect to pay for kitchen cabinets installation is to provide an estimate with a prices per each cabinet depending on its type and dimensions. Before issuing a final itemized estimate for the scope of work to perform a contractor will inspect the kitchen area and analyze work complexity according to kitchen layout and blueprints. On average total price for stock kitchen cabinets installation in 12’ x 12’ kitchen will vary from $1,300 to $1,700. Expect to spend 80% - 105% more for installation of high end custom cabinets. In the total cost will be included installation of wood fillers, moldings, toe kicks, refrigerator and dishwasher wood panels. $12 - $17 / ln. ft.
$8 - $11 / ln. ft.
$19 - $25 / ln. ft.
$12 - $18 / ln. ft.
$25 - $35 / ln. ft.
$15 - $30 / ln. ft.
What are typical extra fees for standard cabinets installation? In practice there are a lot of things which might affect the cost to get cabinets installed and labor prices per cabinet installed will be adjusted adequately. If there are multiple cutouts for electrical outlets, water or drain pipes the total price might go up. On the remodeling projects especially in older houses it might be much harder to install cabinets because of not leveled walls or floor. Some cabinets might require assembling very similar to IKEA kitchen cabinets. Depending on the complication of an assembling process the total price might increase up to 100%. Why custom high end cabinets are more expensive to install than standard stock cabinets? Custom high end cabinets require more time to install and will result in higher labor cost. It is way more precise work in comparison with installation of standard stock cabinets. Some even minor imperfections during the installation of high end cabinets are unacceptable. Depending on level of customization a contractor can charge $2,500 - $3,700 for labor alone to install custom cabinets and stylish crow molding in a 300 ft2 kitchen with an island. 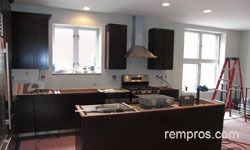 How much did you spend or think it is a fair price to pay for kitchen cabinets installation?